Holiday break is coming up quick and it’s a wonderful time full of laughs, family, and likely a bit of boredom for your teenagers. The holiday season is such a special time and it allows us to bond with our loved ones, but it’s also a time to help your teenager catch up on school work or even get ahead. 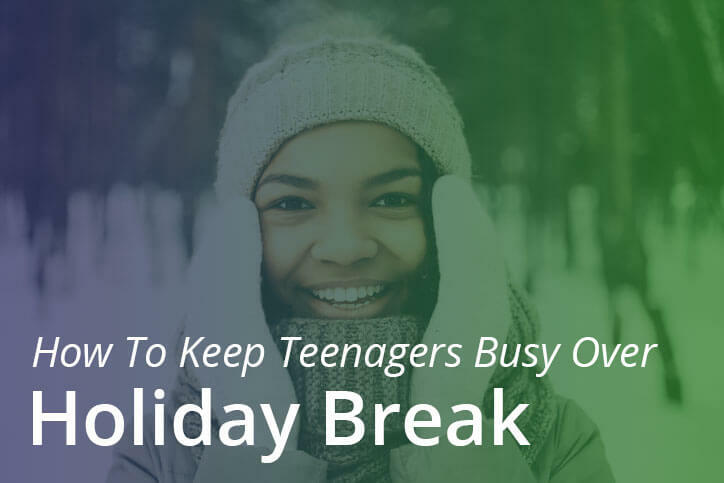 To keep your teenagers from getting too bored or to finish any school work they still have to do this holiday break, we’ve come up with a few tips to help you out. Whether your teen attends a traditional or online school, there is always a benefit to creating even the most flexible schedule. Especially when they have a lot of free time. Arm yourself and your teenager with a basic schedule based on the activities and school work that you want them to accomplish over the break. Write this schedule out or print it off for your teen so they can reference it daily. It can be as simple as adding an hour of school work or reading to their day. Keep it consistent and realistic and prioritize any work that they’ve fallen behind on. The library has become almost like a lost art for some. But it is a great place to get some free resources for studying or to expand your teen’s interest in their hobbies. If your teenager is behind on some school work, or if they have the ability to get ahead on some assignments, the library is a great place to focus. Whether you use the library to spend leisure time or to get some homework assignments done it’s a great inexpensive way to get out of the house. If you’re living in Minnesota, you’re never too far from a body of water. Many lakes and parks have free skating and some even have free skate rental. To get some energy out and let your teen socialize a bit, check out your local skating options. Even though it’s getting colder, there are still some great outdoor activities that you can enjoy together. Spending time outside is good for teenagers who are seeking new experiences and who may get easily glued to the television. Fresh air and new activities can spark creative thinking and an openness to new experiences for your teen. We hope you have a wonderful holiday break and if you’re looking for more information on BlueSky, follow us on Facebook!